A Yorkist chronicler under Henry VII’s nose? “Hearne’s Fragment” is a relatively little-known source on late fifteenth century England. It is mysterious in origin, missing in part and not entirely accurate in detail, perhaps using old-style years? This source writes about Hearne’s Fragment and names the most likely writer: Thomas Howard, 2nd Duke of Norfolk. 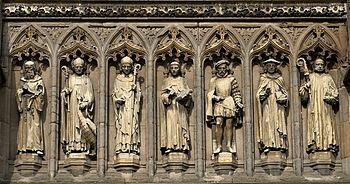 Thomas Howard was born in 1443 and served the Yorkist cause from before the 1469 rebellion. 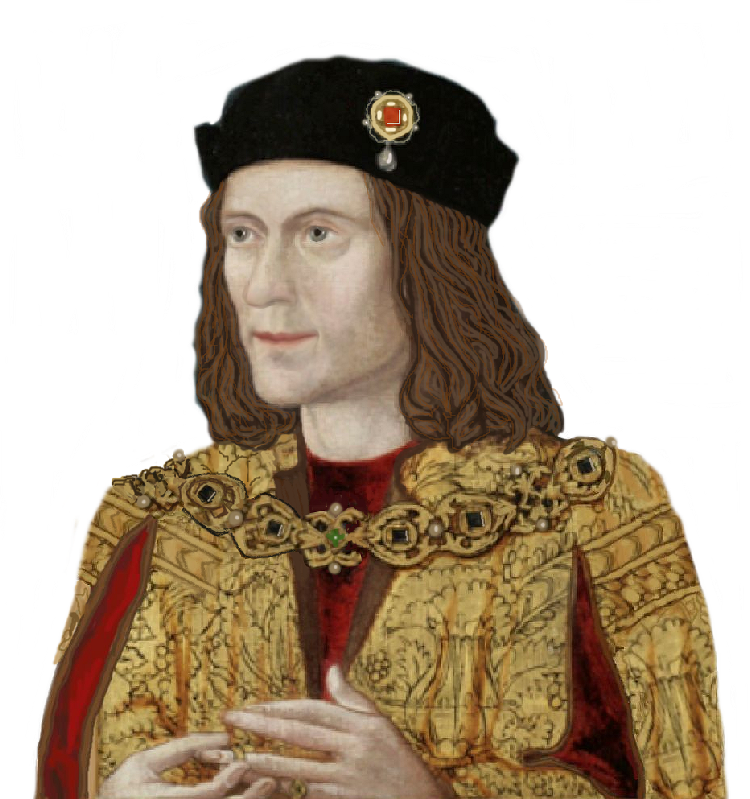 He was given the courtesy title of Earl of Surrey in 1483 and accompanied his father to Bosworth, after which he was imprisoned but restored only to the Earldom in 1489 to undertake various diplomatic duties, such as attending the new King’s daughter’s marriage to James IV. Ironically, he led the English army at Flodden only ten years later, when James was the principal casualty, and was rewarded with the restoration of the family Duchy. He died in 1424 but not before accompanying Henry VIII’s other sister to France for her wedding and presiding over Buckingham’s trial. As for the absence of material about Richard’s reign, the explanation is surely obvious? Henry Stafford fascinates me in a dark sort of way. I walk past the spot where he was executed almost once a week. I have always felt he is marginalised by historians because no one quite knows what to make of his behaviour, so he gets pushed to the side as just an unsuccessful rebel who lost his head. Over the years we have had silly theories, such as the one that he was enraged because didn’t get his hands on the Bohun inheritance quick enough (having to ggo through parliament, it wasn’t coming any quicker!) and the other one that he was horrified by news of the the death of the princes (he was a contender for being’right in there’ if they were killed, and if he actually KNEW, why was it all a case of rumour and whispers; why was he not declaring his knowledge openly across the land?) I am even doubtful about his supposed ‘support’ for Henry Tudor, as what could Henry have given him that he did not already have? I see it more as an alliance of sort, and Henry Stafford may have been as eager for the crown as Tudor. Be that as it may, there is not all that much known about Buckingham, and we don’t even have a proper portrait of him–the one that exists is clearly based on that of Buckingham’s own son, Edward Stafford. In it, he certainly looks roguish, like a medieval Bill Sykes. During my recent research, however, I have come across seveal items of interest of this rather sidelined figure. A few years back a high status decorated boss was found at his manor of Bletchingley, dating from the 1470’s. It may not have been Buckingham’s personal adornment, but it was very likely the possession of one of his retinue. The other item I discovered is perhaps more interesting. The Abbot of Crowland (Croyland) Abbey established a hostel for student monks in Cambridge. Later on between 1472-83, the hostel came under the patronage of the Duke and his family and got a change of name-to Buckingham College. As the Crowland Chronicle is noted as being very pro-Woodville, this could be one reason why this is so; since Catherine Woodville, Queen Elizabeth’s sister, was the wife of Henry Stafford. The college itself (renamed Magdalene in the 16th c) seems quite interesing archaeologically, with a collection of coins known as the ‘Magdalene hoard’ turning up on the edge ofthe property. The story of a spirited Duchess of Norfolk…. This post, about Edward IV’s daughter Catherine, prompted me to post this, about the husband of another of Edward IV’s daughter, Anne, Countess of Surrey. Thomas Howard, eventually 3rd Duke of Norfolk, was the grandson of John Howard, Duke of Norfolk, who fell with Richard at Bosworth. I am not impressed with Thomas Howard, and whether or not he treated Anne well I do not know, but after her death, he certainly did not do right by his second wife. The marriage became a scandal second to none, and if Thomas thought he could do as he pleased with Lady Elizabeth Stafford, he soon learned better. She was made of stern stuff. I have taken the following from the extremely interesting http://www.revolvy.com/main/index.php?s=Elizabeth%20Stafford%2C%20Duchess%20of%20Norfolk&uid=1575 , and make no claim to authorship. If you follow the link, you will find more information, and sources. “Lady Elizabeth Stafford (later Duchess of Norfolk) (c.1497 – 30 November 1558) was the eldest daughter of Edward Stafford, 3rd Duke of Buckingham, and Lady Eleanor Percy. By marriage she became Duchess of Norfolk. Her stormy marriage to Thomas Howard, 3rd duke of Norfolk, created a public scandal. “Before 8 January 1513, when she was only fifteen and he was thirty-five years of age, Elizabeth married, as his second wife, Thomas Howard, then Earl of Surrey. He had previously been married to Anne Plantagenet (2 November 1475 – 23 November 1511), the daughter of King Edward IV, by whom he had a son, Thomas, who died 3 August 1508. “‘He and I had loved together two years, an my lord my husband had not sent immediately word after my lady and my lord’s first wife was dead, he made suit to my lord my father, or else I had been married before Christmas to my Lord of Westmorland’. “Elizabeth’s father initially attempted to persuade Howard to marry one of his other daughters, but according to Elizabeth, ‘He would have none of my sisters, but only me’. “Elizabeth brought Howard a dowry of 2000 marks, and was promised a jointure of 500 marks a year, although Howard apparently never kept that promise. In her later letters she asserted that she had been a dutiful wife, continuing to serve at court daily ‘sixteen years together’ while her husband was absent in King Henry VIII’s wars, and accompanying him to Ireland when he was posted there in 1520–22. She bore him five children, and according to Graves, as late as 1524, when he became 3rd Duke of Norfolk, ‘they appeared to be bonded by mutual love’. “However, in 1527 Norfolk took a mistress, Bess Holland, the daughter of his steward, with whom he lived openly at Kenninghall, and whom the Duchess described variously in her letters as a bawd, a drab, and ‘a churl’s daughter’, ‘which was but washer of my nursery eight years’. It appears the Duchess’ anger caused her to exaggerate Bess Holland’s inferior social status, as her family were probably minor gentry, and she eventually became a lady-in-waiting to Queen Anne Boleyn. “During the long period in which King Henry VIII sought to have his marriage to Catherine of Aragon annulled, the Duchess remained staunchly loyal to Queen Catherine and antagonistic towards her husband’s niece, Anne Boleyn, with whom the King was infatuated. Late in 1530 it was noted that the Duchess was secretly conveying letters to Queen Catherine from Italy concealed in oranges, which the Queen passed on to the Imperial ambassador, Eustace Chapuys, and at one time the Duchess told Chapuys that her husband, the Duke, had confided in her that Anne would be ‘the ruin of all her family’. In 1531 the Duchess was exiled from court at Anne Boleyn’s request for too freely declaring her loyalty to Catherine. “According to Graves, the Duchess also quarrelled with Anne over Anne’s insistence that the Duchess’ daughter, Mary Howard, should marry Henry VIII’s illegitimate son, Henry Fitzroy. When Anne Boleyn was crowned on 1 June 1533, the Duchess refused to attend the coronation ‘from the love she bore to the previous Queen’. “Meanwhile, the Duchess’ own marriage continued to deteriorate. The Duke refused to give up his mistress, and resolved to separate from his wife. 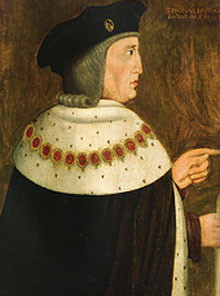 Both the Duke and Thomas Cromwell requested the Duchess’ brother to take her in, a suggestion he utterly rejected.The Duchess wrote of her husband’s abuse of her during this period, claiming that when she was recovering after the birth of her daughter, Mary, he had pulled her out of bed by the hair, dragged her through the house, and wounded her with a dagger. In three separate letters to Cromwell the Duchess repeated the accusation that the Duke had ‘set his women to bind me till blood came out at my fingers’ ends, and pinnacled me, and sat on my breast till I spit blood, and he never punished them’. Howard responded to the stream of allegations by writing that ‘I think the apparent false lies were never contrived by a wife of her husband that she doth daily increase of me’. “I am of age to rule myself, as I have done these five years, since my husband put me away. Seeing that my lord my husband reckoned me to be so unreasonable, it were better that I kept me away, and keep my own house still, and trouble no other body. . . I pray you, my lord, take no displeasure with me, although I have not followed your lordship’s good counsel, and your letters, as touching my lord my husband for to come home again, which I will never do in my life. “The Duchess’ entreaties to Cromwell ceased with his fall from power in 1540. She and her brother were eventually reconciled, and at some time before 1547 he sent one of his daughters to live with her, whom the Duchess treated very generously. 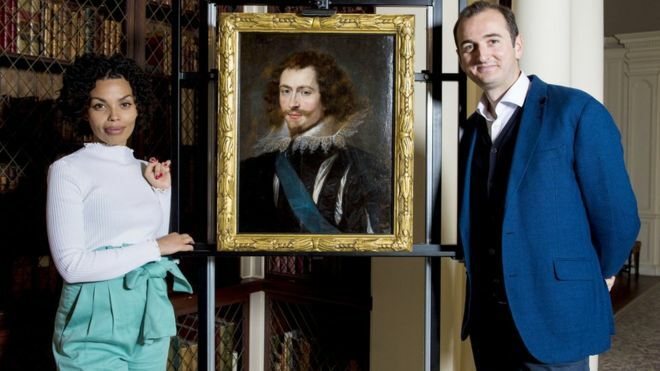 “During Henry VIII’s last years Edward Seymour, 1st Earl of Hertford, and Henry’s last Queen, Catherine Parr, both of whom favoured the reformed faith, gained influence with the King while the conservative Duke of Norfolk became isolated politically. The Duke attempted to form an alliance with the Seymours through a marriage between his widowed daughter, Mary Howard, and Hertford’s brother, Thomas Seymour, but the effort was forestalled by the provocative conduct of the Duke’s eldest son and heir, Henry Howard, Earl of Surrey, who had displayed in his own heraldry the royal arms and insignia. On 12 December 1546 both Norfolk and Surrey were arrested and sent to the Tower. On 12 January 1547 Norfolk acknowledged that he had ‘concealed high treason, in keeping secret the false acts of my son, Henry Earl of Surrey, in using the arms of St. Edward the Confessor, which pertain only to kings’, and offered his lands to the King. Norfolk’s family, including the Duchess, his daughter Mary, and his mistress, Bess Holland, all gave evidence against him. Surrey was beheaded on 19 January 1547, and on 27 January 1547 Norfolk was attainted by statute without trial. The dying King gave his assent to Norfolk’s death by royal commissioners, and it was rumoured that he would be executed on the following day. He was saved by the King’s death on 28 January and the Council’s decision not to inaugurate the new reign with bloodshed. “Norfolk remained in the Tower throughout the reign of King Edward VI. 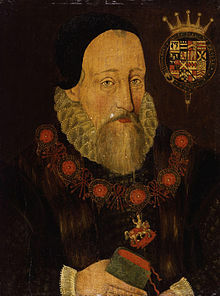 He was released and pardoned by Queen Mary in 1553, and in Mary’s first parliament (October–December 1553), his statutory attainder was declared void, thereby restoring him to the dukedom. He died at Kenninghall on 25 August 1554, and was buried at St Michael’s Church at Framlingham in Suffolk. The Duchess was not named in his will.